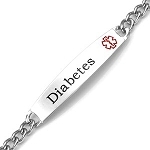 This sleek sterling silver medical ID bracelet has a curb chain with a lobster claw clasp. Plaque measures approximately 1 7/8 x 1/4 inch. Available is several lengths. Bracelet width is 1/4 inch. Medical alert wallet card included. 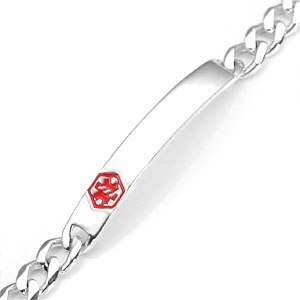 This is a beautiful bracelet. Overall, I am very pleased with it. 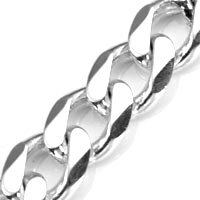 The links are substantial enough that I feel it's secure, yet delicate enough that it looks nice. It's very comfortable. I wish I had only had one line engraved, as it's very narrow for 2 lines. This bracelet would be considered a wonderful piece of jewelry as well as great protection for my allergies. I cannot say enough good things about it. Such a great buy! !